This article is about the British banking firm. For items that may be pluralised as "Barclays", see Barclay (disambiguation). Barclays plc (/ˈbɑːrkliz, -leɪz/) is a British multinational investment bank and financial services company, headquartered in London. Apart from investment banking, Barclays is organised into four core businesses: personal banking, corporate banking, wealth management, and investment management. Barclays traces its origins to a goldsmith banking business established in the City of London in 1690. James Barclay became a partner in the business in 1736. 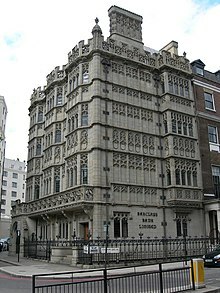 In 1896, several banks in London and the English provinces, including Backhouse's Bank and Gurney's Bank, united as a joint-stock bank under the name Barclays and Co. Over the following decades, Barclays expanded to become a nationwide bank. In 1967, Barclays deployed the world's first cash dispenser. Barclays has made numerous corporate acquisitions, including of London, Provincial and South Western Bank in 1918, British Linen Bank in 1919, Mercantile Credit in 1975, the Woolwich in 2000 and the North American operations of Lehman Brothers in 2008. Barclays has a primary listing on the London Stock Exchange and is a constituent of the FTSE 100 Index. It has a secondary listing on the New York Stock Exchange. Qatar Holdings, an investment vehicle of the State of Qatar, is the largest shareholder of the company. According to a 2011 paper by Vitali et al., Barclays was the most powerful transnational corporation in terms of ownership and thus corporate control over global financial stability and market competition, with AXA and State Street Corporation taking the 2nd and 3rd positions, respectively. Barclays traces its origins back to 1690 when John Freame, a Quaker, and Thomas Gould started trading as goldsmith bankers in Lombard Street, London. The name "Barclays" became associated with the business in 1736, when Freame's son-in-law James Barclay became a partner. In 1728 the bank moved to 54 Lombard Street, identified by the 'Sign of the Black Spread Eagle', which in subsequent years would become a core part of the bank's visual identity. The Barclay family were connected with slavery, both as proponents and opponents. David and Alexander Barclay were engaged in the slave trade in 1756. David Barclay of Youngsbury (1729-1809), on the other hand, was a noted abolitionist, and Verene Shepherd, the Jamaican historian of diaspora studies, singles out the case of how he chose to free his slaves in that colony. In 1776 the firm was styled "Barclay, Bevan and Bening" and so remained until 1785, when another partner, John Tritton, who had married a Barclay, was admitted, and the business then became "Barclay, Bevan, Bening and Tritton". In 1896 several banks in London and the English provinces, notably Backhouse's Bank of Darlington and Gurney's Bank of Norwich (both of which also had their roots in Quaker families), united under the banner of Barclays and Co., a joint-stock bank. Between 1905 and 1916 Barclays extended its branch network by making acquisitions of small English banks. Further expansion followed in 1918 when Barclays amalgamated with the London, Provincial and South Western Bank and in 1919 when the British Linen Bank was acquired by Barclays Bank, although the British Linen Bank retained a separate board of directors and continued to issue its own bank notes (see Banknotes of the pound sterling). In 1925 the Colonial Bank, National Bank of South Africa and the Anglo-Egyptian Bank were amalgamated and Barclays operated its overseas operations under the name Barclays Bank (Dominion, Colonial and Overseas) – Barclays DCO. In 1938 Barclays acquired the first Indian exchange bank, the Central Exchange Bank of India, which had opened in London in 1936 with the sponsorship of Central Bank of India. In 1941 during the Nazi Occupation of France, a branch of Barclays in Paris headed by Marcel Cheradame worked directly with the invading force. Senior officials at the bank volunteered the names of Jewish employees as well as ceding an estimated 100 Jewish bank accounts to the Nazi occupiers. The Paris branch used its funds to increase the operational power of a large quarry that helped produce steel for the Nazis. There was no evidence of contact between the head office in London and the branch in Paris during the occupation. Marcel Cheradame was kept as the branch manager until he retired in the sixties. In May 1958, Barclays was the first UK bank to appoint a female bank manager. Hilda Harding managed Barclays' Hanover Square branch in London until her retirement in 1970. In 1965, Barclays established a US affiliate, Barclays Bank of California in San Francisco. Barclays launched the first credit card in the UK, Barclaycard, in 1966. On 27 June 1967, Barclays deployed the world's first cash machine, in Enfield. The British actor Reg Varney was the first person to use the machine. In 1969, a planned merger with Martins Bank and Lloyds Bank was blocked by the Monopolies and Mergers Commission, but the acquisition of Martins Bank on its own was later permitted. Also that year, the British Linen Bank subsidiary was sold to the Bank of Scotland in exchange for a 25% stake, a transaction that became effective from 1971. Barclays DCO changed its name to Barclays Bank International in 1971. In August 1975, following the secondary banking crash, Barclays acquired Mercantile Credit Company. In 1980, Barclays Bank International expanded its business to include commercial credit and took over American Credit Corporation, renaming it Barclays American Corporation. The following year Barclays Bank and Barclays Bank International merged, and as part of the corporate reorganisation the former Barclays Bank plc became a group holding company, renamed Barclays plc, and UK retail banking was integrated under the former BBI, and renamed Barclays Bank PLC from Barclays Bank Limited. In 1986 Barclays sold its South African business operating under the Barclays National Bank name after protests against Barclays' involvement in South Africa and its apartheid government. Also that year Barclays bought de Zoete & Bevan and Wedd Durlacher (formerly Wedd Jefferson) to form Barclays de Zoete Wedd (BZW), now known as the Barclays Investment Bank, and to take advantage of the Big Bang on the London Stock Exchange. Barclays introduced the Connect card in June 1987, the first debit card in the United Kingdom. In 1988, Barclays sold Barclays Bank of California, which at that time was the 17th-largest bank in California measured by assets, to Wells Fargo for US$125 million in cash. Edgar Pearce, the "Mardi Gra Bomber", began a terror campaign against the bank and the supermarket chain Sainsbury's in 1994. In 1996, Barclays bought Wells Fargo Nikko Investment Advisors (WFNIA) and merged it with BZW Investment Management to form Barclays Global Investors. Two years later, in 1998, the BZW business was broken up and parts were sold to Credit Suisse First Boston: Barclays retained the debt business which formed the foundation of what is now Barclays Capital. In 1999, in an unusual move as part of the trend at the time for free ISPs, Barclays launched an internet service called Barclays.net: this entity was acquired by British Telecom in 2001. In August 2000, Barclays took over the recently de-mutualised Woolwich PLC, formerly the Woolwich Building Society, in a £5.4bn acquisition. Woolwich PLC thus joined the Barclays group of companies, and the Woolwich name was retained after the acquisition. The company's head office remained in Bexleyheath, south-east London, four miles from the original head office in Woolwich. In 2001 Barclays closed 171 branches in the UK, many of them in rural communities: Barclays called itself "THE BIG BANK" but this name was quickly given a low profile after a series of embarrassing PR stunts. On 31 October 2001, Barclays and CIBC agreed to combine their Caribbean operations to establish joint venture company known as FirstCaribbean International Bank (FCIB). In 2003, Barclays bought the American credit card company Juniper Bank from CIBC, re-branding it as "Barclays Bank Delaware". The same year saw the acquisition of Banco Zaragozano, the 11th largest Spanish bank. Barclays took over sponsorship of the Premier League from Barclaycard in 2004. In May 2005, Barclays moved its group headquarters from Lombard Street in the City of London to One Churchill Place in Canary Wharf. Also in 2005 Barclays sealed a £2.6bn takeover of Absa Group Limited, South Africa's largest retail bank, acquiring a 54% stake on 27 July 2005. Then in 2006, Barclays purchased the HomEq Servicing Corporation for US$469 million in cash from Wachovia Corp. That year also saw the acquisition of the financial website CompareTheLoan and Barclays announcing plans to rebrand Woolwich branches as Barclays, migrating Woolwich customers onto Barclays accounts and migrating back-office processes onto Barclays systems – the Woolwich brand was to be used for Barclays mortgages. Barclays also exited retail-banking operations in the Caribbean-region which extended as far back as 1837 through selling of its joint venture stake in FirstCaribbean International Bank (FCIB) to CIBC for between $989 million and $1.08 billion. 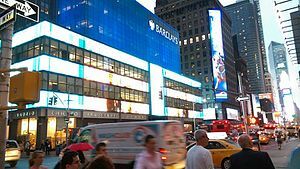 In January 2007, Barclays announced that it had purchased the naming rights to the Barclays Center, a proposed 18,000-seat arena in Brooklyn, New York, where the New Jersey Nets planned to relocate. In March 2007, Barclays announced plans to merge with ABN AMRO, the largest bank in the Netherlands. However, on 5 October 2007 Barclays announced that it had abandoned its bid, citing inadequate support by ABN shareholders. Fewer than 80% of shares had been tendered to Barclays' cash-and-shares offer. This left the consortium led by Royal Bank of Scotland free to proceed with its counter-bid for ABN AMRO. To help finance its bid for ABN AMRO, Barclays sold a 3.1% stake to China Development Bank and a 3% stake to Temasek Holdings, the investment arm of the Singaporean government. Also in 2007, Barclays agreed to purchase Equifirst Corporation from Regions Financial Corporation for US$225 million. That year also saw Barclays Personal Investment Management announcing the closure of their operation in Peterborough and its re-siting to Glasgow, laying off nearly 900 members of staff. On 30 August 2007, Barclays was forced to borrow £1.6 billion (US$3.2 billion) from the Bank of England sterling standby facility. This is made available as a last-resort when banks are unable to settle their debts to other banks at the end of daily trading. Despite rumours about liquidity at Barclays, the loan was necessary due to a technical problem with their computerised settlement network. A Barclays spokesman was quoted as saying "There are no liquidity issues in the U.K markets. Barclays itself is flush with liquidity." On 9 November 2007, Barclays shares dropped 9% and were even temporarily suspended for a short period of time, due to rumours of a £4.8 billion (US$10 billion) exposure to bad debts in the US. However, a Barclays spokesman denied the rumours. Barclays sought to raise capital privately, avoiding direct equity investment from the UK government, which was offered to boost its capital ratio. Barclays believed that "maintaining its independence from government was in the best interests of its shareholders". In July 2008, Barclays attempted to raise £4.5 billion through a non-traditional rights issue to shore up its weakened Tier 1 capital ratio, which involved a rights offer to existing shareholders and the sale of a stake to Sumitomo Mitsui Banking Corporation. Only 19% of shareholders took up their rights leaving investors China Development Bank and Qatar Investment Authority with increased holdings in the bank. Barclays launched a further round of capital raising, approved by special resolution on 24 November 2008, as part of its overall plan to achieve higher capital targets set by the FSA to ensure it would remain independent. Barclays raised £7 billion from investors from Abu Dhabi and Qatar. Existing Barclays shareholders complained they were not offered full pre-emption rights in this round of capital raising, even threatening to revolt at the extraordinary meeting. Sheikh Mansour and Qatar Holding agreed to open up £500 million of their new holdings of reserve capital instruments for clawback. Existing investors now took this up. In 2008, Barclays bought the credit card brand Goldfish for US$70 million gaining 1.7 million customers, and US$3.9 billion in receivables. Barclays also bought a controlling stake in the Russian retail bank Expobank for US$745 million. Later in the year Barclays commenced its Pakistan operations with initial funding of US$100 million. On 16 September 2008, Barclays announced its agreement to purchase, subject to regulatory approval, the investment-banking and trading divisions of Lehman Brothers (including its New York skyscraper) which was a United States financial conglomerate that had filed for bankruptcy. 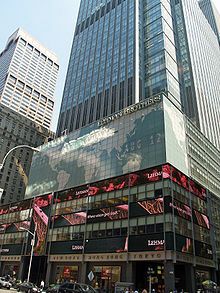 On 20 September 2008, a revised version of the deal, a US$1.35 billion (£700 million) plan for Barclays plc to acquire the core business of Lehman Brothers (mainly Lehman's US$960 million Midtown Manhattan office skyscraper, with responsibility for 9,000 former employees), was approved. After a seven-hour hearing, New York bankruptcy court Judge James Peck ruled: "I have to approve this transaction because it is the only available transaction. Lehman Brothers became a victim, in effect the only true icon to fall in a tsunami that has befallen the credit markets. This is the most momentous bankruptcy hearing I've ever sat through. It can never be deemed precedent for future cases. It's hard for me to imagine a similar emergency." Luc Despins, the creditors committee counsel, said: "The reason we're not objecting is really based on the lack of a viable alternative. We did not support the transaction because there had not been enough time to properly review it." In the amended agreement, Barclays would absorb US$47.4 billion in securities and assume US$45.5 billion in trading liabilities. Lehman's attorney Harvey R. Miller of Weil, Gotshal & Manges, said "the purchase price for the real estate components of the deal would be US$1.29 billion, including US$960 million for Lehman's New York headquarters and US$330 million for two New Jersey data centres. Lehman's original estimate valued its headquarters at US$1.02 billion but an appraisal from CB Richard Ellis this week valued it at US$900 million." Further, Barclays will not acquire Lehman's Eagle Energy unit, but will have entities known as Lehman Brothers Canada Inc, Lehman Brothers Sudamerica, Lehman Brothers Uruguay and its Private Investment Management business for high-net-worth individuals. Finally, Lehman will retain US$20 billion of securities assets in Lehman Brothers Inc that are not being transferred to Barclays. Barclays had a potential liability of US$2.5 billion to be paid as severance, if it chooses not to retain some Lehman employees beyond the guaranteed 90 days. In September 2014, Barclays was ordered to pay $15 million in settlement charges that alleged the bank had failed to maintain an adequate internal compliance system after its acquisition of Lehman Brothers during the 2008 financial crisis. The former headquarters of Barclays Global Investors in San Francisco, United States; Barclays sold Barclays Global Investors to BlackRock in 2009. Reuters later reported that the British government would inject £40 billion (US$69 billion) into three banks including Barclays, which might seek over £7 billion. Barclays later confirmed that it rejected the Government's offer and would instead raise £6.5 billion of new capital (£2 billion by cancellation of dividend and £4.5 billion from private investors). Barclays' share price fell 54% in June 2009 after the International Petroleum Investment Company (IPIC), which had invested up to £4.75 billion in November 2008, sold 1.3 billion Barclays shares.Qatar Holding sold a 3.5% stake worth £10 billion in October 2009, and a further sale of warrants worth around £750 million in November 2012, but remains one of the bank's largest shareholders. In July 2012, Barclays revealed that the FSA was investigating whether the bank adequately disclosed fees paid to Qatar Investment Authority. In August 2012, the Serious Fraud Office announced an investigation into the Middle East capital raising. The Financial Services Authority announced an expansion of the investigation into the Barclays-Qatar deal in January 2013, focusing on the disclosure surrounding the ownership of the securities in the bank. In January 2009, the press reported that further capital may be required and that while the government might be willing to fund this, it may be unable to do so because the previous capital investment from the Qatari state was subject to a proviso that no third party might put in further money without the Qataris receiving compensation at the value the shares had commanded in October 2008. In March 2009, it was reported that in 2008, Barclays received billions of dollars from its insurance arrangements with AIG, including US$8.5 billion from funds provided by the United States to bail out AIG. On 12 June 2009, Barclays sold its Global Investors unit, which included its exchange traded fund business, iShares, to BlackRock for US$13.5 billion. Standard Life sold Standard Life Bank plc to Barclays plc in October 2009. The sale was completed on 1 January 2010. On 11 November 2009, Barclays and First Data, a global technology provider of information commerce, had entered into an agreement according to which Barclays would migrate a range of card portfolios to First Data's issuing and consumer finance platform. On 13 February 2010, Barclays announced it would pay more than £2 billion in bonuses. In March 2011 it was reported that Barclays had overtaken Santander UK to claim top spot as the UK's most complained against bank, with the country's official banking regulator, the Financial Services Authority having recorded 276,315 new customer complaints against Barclays Bank during the second half of 2010. Barclays nevertheless ranks only third in the UK among the mainstream clearing banks in terms of the number of its branches. Inline with costs cut, Barclays cut 1,400 jobs during the first half of 2011 and cut another 1,600 jobs for the rest of 2011. In March 2012, the trading names of Barclays Capital, Barclays Wealth and Barclays Corporate were each changed to simply "Barclays", as part of an effort to simplify the operations of the company and to promote greater integration between its divisions. In June 2012 Barclaycard acquired Analog Analytics, a digital coupon and daily deal business similar to Groupon. In October 2012, Barclays announced it had agreed to buy the ING Direct UK business of the ING Group. The transfer of the business to Barclays was approved at the High Court on 20 February 2013 and ING Direct was renamed Barclays Direct and will be integrated into the existing Barclays business within two years. In February 2013, Barclays announced a net loss of £1.04 billion for 2012, its first annual loss in two decades, together with plans to cut 3,700 jobs, reduce annual costs by £1.7 billion, and scale back its retail banking activities in Europe and Asia. In May 2014, Barclays announced it would cut 19,000 jobs over 3 years with 12,000 jobs cut in 2014. Investment banking will cut 2,000 jobs in 2014 and up to 7,000 jobs totally in 2016 making the investment banking portion shrink from 50 percent in 2014 to 30 percent of Barclay's assets in 2016. Barclays announced in June 2015 that it would sell its US wealth and investment management business to Stifel for an undisclosed fee. Barclays sold its Retail Banking unit in Spain to Caixabank in 2014. At its peak, Barclays had 5,100 employees and 600 offices in Spain. In 2014 the bank had 2,800 employees and 270 offices. With the sale, Caixabank acquired around 550,000 new retail and private banking clients and 2,400 employees. In August 2015 it was announced that Barclays would become the first UK high street bank to start accepting bitcoin, with the bank revealing that it plans to allow users to make charitable donations using the virtual currency. In March 2016, it was announced that Barclays has plans to sell its Africa business amid falling profits. In April 2016, Barclays announced a deal that allowed its UK customers to use Apple Pay. The bank announced in May 2017 that it would sell 1.5 billion pounds worth of shares of its Barclays Africa Group subsidiary as part of its strategy to refocus its business from Africa to the UK and US. In September 2017, Barclay's sold off the last part of its retail banking segment on continental Europe after selling its French retail, wealth and investment management operations to AnaCap. To ward off the effects of Brexit, Barclays borrowed £6bn from the Bank of England between April and June 2017, as part of a post-referendum stimulus package launched in August 2016. The former boss of Barclays, Bob Diamond, opined in an interview with The Independent in September 2017 that the City of London would feel a stronger negative impact from Brexit than generally expected. Diamond argued that both banking jobs and legal and support operations would eventually relocate to the Continent. Barclays' operations are organised within two business 'clusters': Corporate and Investment Banking and Wealth and Investment Management; and Retail and Business Banking. The Corporate and Investment Banking and Wealth and Investment Management cluster comprises three business units: Corporate banking; Investment banking; and Wealth and investment management. The Retail and Business Banking cluster comprises four business units: Africa Retail and Business Banking; Barclaycard (credit card and loan provision); Europe Retail and Business Banking; and UK Retail and Business Banking. Barclays National Bank: former vice chairman, Julian Ogilvie Thompson. Barclays has over 4,750 branches in about 55 countries and of which about 1,600 are in the United Kingdom. In the UK, Barclays also offers some personal banking services through branches of the Post Office. Most Barclays branches have 24/7 ATMs. Barclays customers and the customers of many other banks can use Barclays ATMs for free in the UK, although in some other countries fees are charged. Barclays is a member of the Global ATM Alliance, an alliance of international banks which allows each banks' customers to use their ATM or debit card at all other member banks with no ATM access fees when travelling internationally. The Group Chairman is John McFarlane, who joined the Board on 1 January 2015 and became chairman at the annual general meeting on 23 April 2015. McFarlane became executive chairman on 8 July after the dismissal of Group Chief Executive Antony Jenkins. On 28 October 2015 Barclays announced that Jes Staley, managing partner at BlueMountain Capital and member of the board of directors of UBS, has been appointed as Group Chief Executive Officer of Barclays effective 1 December 2015. Barclays sponsored the Premier League from 2001 to 2016 (from 2001 to 2004 under the Barclaycard brand) and, from 2006, the Churchill Cup. All three governing bodies of the permanent participants agreed to end the tournament after its 2011 edition. Barclays also sponsored The Football League from 1987 until 1993, succeeding Today newspaper and being replaced by Endsleigh Insurance. It also sponsored the 2008 Dubai Tennis Championships. Barclays was the sponsor of the Barclays Cycle Hire scheme in London from 2010 to 2015, as part of a £25 million deal with Transport for London. In 1998, Barclays Bank agreed to pay $3.6m to Jews whose assets were seized from French branches of the British-based bank during World War II. Barclays, along with seven French banks, was named in a lawsuit filed in New York on behalf of Jews who were unable to reclaim money they deposited during the Nazi era. Barclays helped to fund President Robert Mugabe's government in Zimbabwe. The most controversial of a set of loans provided by Barclays is the £30m it gave to help sustain land reforms that saw Mugabe seize white-owned farmland and drive more than 100,000 black workers from their homes. Opponents have called the bank's involvement a 'disgrace' and an 'insult' to the millions who have suffered human rights abuses. Barclays spokesmen say the bank has had customers in Zimbabwe for decades and abandoning them now would make matters worse, "We are committed to continuing to provide a service to those customers in what is clearly a difficult operating environment". Barclays also provides two of Mugabe's associates with bank accounts, ignoring European Union sanctions on Zimbabwe. The men are Elliot Manyika and minister of public service Nicholas Goche. Barclays has defended its position by insisting that the EU rules do not apply to its 67%-owned Zimbabwean subsidiary because it was incorporated outside the EU. In March 2009, Barclays was accused of violating international anti-money laundering laws. According to the NGO Global Witness, the Paris branch of Barclays held the account of Equatorial Guinean President Teodoro Obiang's son, Teodorin Obiang, even after evidence that Obiang had siphoned oil revenues from government funds emerged in 2004. According to Global Witness, Obiang purchased a Ferrari and maintains a mansion in Malibu with the funds from this account. A 2010 report by the Wall Street Journal described how Credit Suisse, Barclays, Lloyds Banking Group, and other banks were involved in helping the Alavi Foundation, Bank Melli, the Iranian government, and/or others circumvent US laws banning financial transactions with certain states. They did this by 'stripping' information out of wire transfers, thereby concealing the source of funds. Barclays settled with the government for US$298 million. In March 2009, Barclays obtained an injunction against The Guardian to remove from its website confidential leaked documents describing how SCM, Barclays' structured capital markets division, planned to use more than £11 billion of loans to create hundreds of millions of pounds of tax benefits, via "an elaborate circuit of Cayman Islands companies, US partnerships and Luxembourg subsidiaries". In an editorial on the issue, The Guardian pointed out that, due to the mismatch of resources, tax-collectors (HMRC) now have to rely on websites such as WikiLeaks to obtain such documents, and indeed the documents in question have now appeared on WikiLeaks. Separately, another Barclays whistleblower revealed several days later that the SCM transactions had produced between £900 million and £1 billion in tax avoidance in one year, adding that "The deals start with tax and then commercial purpose is added to them." In February 2012 Barclays was forced to pay £500 million in tax which it had tried to avoid. Barclays was accused by HMRC of designing two schemes that were intended to avoid substantial amounts of tax. Tax rules forced the bank to tell the UK authorities about its plans. David Gauke, Exchequer Secretary to the Treasury, said that "We do not take today's action lightly, but the potential tax loss from this scheme and the history of previous abuse in this area mean that this is a circumstance where the decision to change the law with full retrospective effect is justified." In June 2012, as a result of an international investigation, Barclays Bank was fined a total of £290 million (US$450 million) for manipulating the daily settings of London Interbank Offered Rate (Libor) and the Euro Interbank Offered Rate (Euribor). The United States Department of Justice and Barclays officially agreed that "the manipulation of the submissions affected the fixed rates on some occasions". The bank was found to have made 'inappropriate submissions' of rates which formed part of the Libor and Euribor setting processes, sometimes to make a profit, and other times to make the bank look more secure during the financial crisis. This happened between 2005 and 2009, as often as daily. The BBC said revelations concerning the fraud were "greeted with almost universal astonishment in the banking industry." The UK's Financial Services Authority (FSA), which levied a fine of £59.5 million ($92.7 million), gave Barclays the biggest fine it had ever imposed in its history. The FSA's director of enforcement described Barclays' behaviour as "completely unacceptable", adding "Libor is an incredibly important benchmark reference rate, and it is relied on for many, many hundreds of thousands of contracts all over the world." The bank's chief executive Bob Diamond decided to give up his bonus as a result of the fine. Liberal Democrat politician Lord Oakeshott criticised Diamond, saying: "If he had any shame he would go. If the Barclays board has any backbone, they'll sack him." The US Department of Justice has also been involved, with "other financial institutions and individuals" under investigation. On 2 July 2012, Marcus Agius resigned from the chairman position following the interest rate rigging scandal. On 3 July 2012, Bob Diamond resigned with immediate effect, leaving Marcus Agius to fill his post until a replacement is found. Within the space of a few hours, this was followed by the resignation of the Bank's chief operating officer, Jerry del Missier. Barclays subsequently announced that Antony Jenkins, its existing chief executive of Global Retail & Business Banking would become group chief executive on 30 August 2012. On 17 February 2014 the Serious Fraud Office charged three former bank employees Peter Charles Johnson, Jonathan James Mathew and Stylianos Contogoulas with manipulating Libor rates between June 2005 and August 2007. Barclays' June and November 2008 capital raisings are the subject of investigations. The Serious Fraud Office (United Kingdom) commenced its investigation in August 2012. In October 2012, the United States Department of Justice and the US Securities and Exchange Commission informed Barclays they had commenced an investigation into whether the group's relationships with third parties who assist Barclays to win or retain business are compliant with the US Foreign Corrupt Practices Act. The Financial Services Authority announced an expansion of the investigation into the Barclays-Qatar deal in January 2013, focusing on the disclosure surrounding the ownership of the securities in the bank. Barclays had sought to raise capital privately, avoiding direct equity investment from the Government of the United Kingdom and, therefore, a bailout. The result was Abu Dhabi's £3.5 billion investment in the bank, a deal in which H.H. Sheikh Mansour bin Zayed Al Nahyan made a profit of £3.5 billion. Much of the focus to date has been on the injections by Qatar in June and November 2008, notably the so far unproven allegation that Barclays lent Qatar the money to invest in the bank. Other questions include what happened to the £110 million in fees paid by Barclays ostensibly to Sheikh Mansour, and the £66 million provided by Barclays to the Qataris for unexplained "advisory fees". In June 2017, following a five-year investigation by the UK's Serious Fraud Office covering Barclays' activities during the financial crisis of 2007–2008, former CEO John Varley and three former colleagues, Roger Jenkins, Thomas Kalaris and Richard Boath, were charged with conspiracy to commit fraud and the provision of unlawful financial assistance in connection with capital raising. In February 2018, the Serious Fraud Office charged Barclays with "unlawful financial assistance" related to billions of pounds raised from the Qatar deal. In July 2013 US energy regulator the Federal Energy Regulatory Commission (FERC) ordered Barclays to pay £299 million fine penalty for attempting to manipulate electricity market in the US. The fine by FERC relates to allegations in December 2008. In May 2014 the Financial Conduct Authority fined the bank £26 million over systems and controls failures, and conflict of interest in relation to the bank and its customers in connection to the gold fixing during the period 2004–2013, and for manipulation of the gold price on 28 June 2012. In June 2014 the US state of New York filed a lawsuit against the bank alleging it defrauded and deceived investors with inaccurate marketing material about its unregulated trading system known as a dark pool. Specifically, the firm was accused of hiding the fact that Tradebot participated in the dark pool when they were in fact one of the largest players. The state, in its complaint, said it was being assisted by former Barclays executives and it was seeking unspecified damages. The bank's shares dropped 5% on news of the lawsuit, prompting an announcement to the London Stock Exchange by the bank saying it was taking the allegations seriously, and was co-operating with the New York attorney general. A month later the bank filed a motion for the suit to be dismissed, saying there had been no fraud, no victims and no harm to anyone. The New York Attorney General's office issued a statement saying the attorney general was confident the motion would fail. On 31 January 2016, Barclays settled with both the New York Attorney General's office and the SEC, agreeing to pay $70 million split evenly between the SEC and New York state, admitting it violated securities laws and agreeing to install an independent monitor for the dark pool. Barclays PLC agreed to pay $150 million to resolve an investigation by New York's banking regulator into a trading practice that allowed the bank to exploit a milliseconds-long lag between an order and its execution that sometimes hurt its clients, the latest fallout from the bank's foreign-exchange business. In certain instances, Barclays used this last-look system to automatically reject client orders that would be unprofitable for the bank because of subsequent price swings during milliseconds-long latency (“hold”) periods. Furthermore, when clients questioned Barclays about these rejected trades, Barclays failed to disclose the reason that the trades were being rejected, instead citing technical issues or providing vague responses. According to the Financial Industry Regulatory Authority, Barclays' inadequate supervisory procedures failed to stop many customers from swapping one mutual fund for another when the benefits of switching might be undermined by the transaction costs, resulting in $8.63 million of losses for their customers between January 2010 and June 2015. Additionally, from March to August 2014, Barclays processed 1,723 fund transactions that were inconsistent with its customers' goals, risk tolerance or other investments which caused an additional $818,000 of customer harm. As a result, Barclays was required to pay $10 million in restitution, including interest, to affected customers and was fined $3.75 million, but did not admit or deny wrongdoing. Barclays Bank (1951). The Eagle Looks Back. a Silver Jubilee Anthology of Twenty-Five Years' Contributions to "The Spread Eagle", the Staff Magazine of Barclays Bank Limited. London: Spread Eagle. OCLC 556739074. Tuke, A. W.; Gillman, R. J. H. (1972). Barclays Bank Limited, 1926–1969: Some Recollections. London: Barclays Bank Ltd. ISBN 978-0-9500442-8-6. ^ a b c d e "Annual Report 2018" (PDF). Retrieved 2 March 2019. ^ "Fact sheet". Citywire. Retrieved 25 February 2018. ^ "Barclays". 4-Traders. Retrieved 16 August 2017. ^ "Wem gehört die Welt?" [Who owns the world?] (PDF). Die Zeit (in German). 31 March 2012. Archived from the original (PDF) on 4 October 2016. Retrieved 16 August 2017. ^ Vitali, Stefania; Glattfelder, James B. & Battiston, Stefano (26 October 2011). "The Network of Global Corporate Control". PLOS. doi:10.1371/journal.pone.0025995. ^ "Company History". Barclays.lk – About us: Our History | 1690–1972. Barclays. Retrieved 11 May 2008. ^ Williams, Eric (1964). Slavery and Capitalism. London: Deutsch. p. 116. ^ Shepherd, Verene (24 February 2008). "Freedom in the era of slavery: The case of the Barclay brothers in Jamaica". The Gleaner. Retrieved 15 January 2018. ^ Ackrill, Margaret; Hannah, Leslie (2001). Barclays: The Business of Banking, 1690-1996. Cambridge University Press. p. 57. ISBN 978-0-521-79035-2. ^ "The Gurney family and banking in Norwich". Heritage City. Archived from the original on 17 July 2010. Retrieved 19 March 2016. ^ "Bank and Agent's House, British Linen Bank". Stirling Archives. Retrieved 19 March 2016. ^ a b c European Association for Banking History (1994). Pohl, Manfred; Freitag, Sabine (eds.). Handbook on the history of European banks. Aldershot, Hants, England: E. Elgar. pp. 1198–1199. ISBN 9781781954218. Retrieved 10 October 2014. ^ Raychaudhuri et al., eds. (1983), Vol. 2, p.782. ^ a b "Holocaust shame of Barclays". The Guardian. Retrieved 1 January 2019. ^ "Barclays to compensate Jews". BBC News. Retrieved 1 January 2019. ^ "Head Office Circular announcing the appointment of Hilda Harding as branch manager". Barclays. 15 May 1958. Retrieved 25 September 2015. ^ "Barclays". Investors chronicle and stock exchange gazette. 10. 5 December 1969. p. 922. Accessed 4 May 2012. ^ Leith McGrandle (5 December 1969). "Barclays". Accountancy. 85. p. 54. Accessed 4 May 2012. ^ "Insert card here". CIO Magazine. July 1988. Retrieved 4 May 2012. ^ a b Milligan, Brian (25 June 2007). "The man who invented the cash machine". BBC News. Retrieved 4 May 2012. ^ Reid, Margaret (1982). The secondary banking crisis, 1973–75: its causes and course. Macmillan. p. 128. ISBN 978-0-333-28376-9. Retrieved 4 May 2012. ^ "Barclays plc". Funding Universe. Retrieved 28 March 2009. ^ "Abstract – SAS-Space". Sas-space.sas.ac.uk. Retrieved 28 June 2012. ^ "About BZW (Barclays de Zoete Wedd)". LinkedIn. Retrieved 23 August 2013. ^ Lerego, Michael (1996). Law of bank payments. FT Law & Tax. p. 472. ISBN 978-0-7520-0037-4. Retrieved 4 May 2012. ^ Fisher, Lawrence M. (16 January 1988). "Wells Fargo to Buy Barclays in California". The New York Times. Retrieved 4 May 2012. ^ "Mardi Gra bomber jailed". BBC News. 14 April 1999. Retrieved 18 April 2011. ^ "Barclays may well soon buy Wells Fargo Nikko". The New York Times. 19 June 1995. Retrieved 18 April 2011. ^ "Revealed: what Credit Suisse really thinks about BZW". 14 November 1997. Archived from the original on 2 November 2012. Retrieved 18 April 2011. ^ "Barclays webpage". Web.archive.org. Archived from the original on 17 May 2007. Retrieved 18 April 2011. ^ "Barclays buys rival Woolwich". BBC News. 11 August 2000. Retrieved 18 April 2011. ^ "Everything is big at Barclays: the chairman's pay has quadrupled just as 171 branches are closing". The Independent. UK. 31 March 2000. Retrieved 18 April 2011. ^ Timmons, Heather (19 August 2004). "Barclays pays $293 million for US credit card issuer". The New York Times. Retrieved 18 April 2011. ^ Timmons, Heather (9 May 2003). "Barclays agrees to buy Spanish bank in cash deal". The New York Times. SPAIN. Retrieved 18 April 2011. ^ "Barclays secures FA Premier League sponsorship". Sportbusiness.com. Retrieved 18 April 2011. ^ "Barclays looks to buy Absa stake". BBC News. 23 September 2004. Retrieved 18 April 2011. ^ Siegel, Aaron (23 June 2006). "Barclays buys Wachovia unit for $469 million". InvestmentNews. Retrieved 16 August 2017. ^ "Cheap Homeowner Loans , Compare Loans , UK Secured Loans". Comparetheloan. Retrieved 18 April 2011. ^ "Barclays plans rebrand of Woolwich". Mad.co.uk. 28 June 2006. Retrieved 18 April 2011. ^ "Barclays sells Caribbean stake". BBC. 28 December 2006. Retrieved 2 March 2019. ^ "Nets' new arena reportedly to be called Barclays Centre". NY1. 17 January 2007. Retrieved 16 August 2017. ^ "Barclays and ABN AMRO Announce Outline of Preliminary Discussions" (Press release). Barclays. 20 March 2007. Archived from the original on 7 January 2009. Retrieved 18 April 2011. ^ Werdigier, Julia (19 March 2007). "Barclays Bank Makes Inquiry on Takeover of ABN Amro". The New York Times. Retrieved 2 February 2012. ^ "Barclays abandons ABN Amro offer". BBC News. 5 October 2007. Retrieved 18 April 2011. ^ "Does RBS's acquisition of ABN AMRO really do what it says on the tin?". City A.M. Archived from the original on 25 January 2009. Retrieved 18 April 2011. ^ "Barclays looks East to fund ABN AMRO purchase". MarketWatch. 23 July 2007. Retrieved 18 April 2011. ^ "Barclays to buy sub-prime lender". The New York Times. 20 January 2007. Retrieved 18 April 2011. ^ "Barclays To Cut 19,000 Jobs Over Three Years". BBC News. 8 May 2014. Retrieved 17 July 2014. ^ Seager, Ashley; Elliott, Larry & Kollewe, Julia (31 August 2007). "Barclays admits borrowing hundreds of millions". The Guardian. UK. Retrieved 18 April 2011. ^ Menon, Jon (31 August 2007). "UK & Ireland". Bloomberg. Archived from the original on 30 September 2007. Retrieved 18 April 2011. ^ "Barclays denies bad debt rumour". BBC News. 9 November 2007. Retrieved 18 April 2011. ^ Lee, Peter. "Barclays keeps apologizing for saving the bank". Euromoney. ^ "Barclays share sale raises £4.5bn". BBC News. 18 July 2008. Retrieved 18 April 2011. ^ "Abigail Hofman: The loser list". Euromoney. 30 October 2008. ^ a b "Barclays Seeks $11.8 Billion From Abu Dhabi and Qatar". The New York Times. 1 November 2008. Retrieved 19 March 2016. ^ "Abigail Hofman: More zeroes than heroes – Barclays". Euromoney. 1 December 2008. ^ Jeffery, Erica (12 May 2014). "Barclays' Qatari capital-raising timeline". Euromoney. ^ Costello, Miles (3 March 2008). "Barclays seals Expobank deal in Russia". The Times. Archived from the original on 8 October 2008. ^ "Barclays Bank UK commences operation in Pakistan". Pakistan Daily. 25 July 2008. Archived from the original on 12 September 2008. ^ Treanor, Jill (16 April 2013). "Barclays to buy Lehman Brothers assets". The Guardian. London. ^ "Judge approves $1.3bn Lehman deal". BBC News. 20 September 2008. Archived from the original on 12 May 2011. Retrieved 18 April 2011. ^ Chasan, Emily (20 September 2008). "Judge approves Lehman, Barclays pact". Reuters. Archived from the original on 26 June 2009. Retrieved 18 April 2011. ^ Tong, Vinnee (21 September 2008). "Judge says Lehman can sell units to Barclays". The Argus-Press. Owosso, Michigan. Associated Press. p. 6A. ^ Teather, David; Treanor, Jill (16 September 2008). "Barclays clinches deal to buy Lehman assets for $2bn". The Guardian. ^ "Barclays to pay $15 million over compliance failures tied to Lehman deal". Reuters. 23 September 2014. ^ Bowker, John; Gowling, Ralph (12 October 2008). "British banks set for 40 billion pound rescue: sources". Reuters. Retrieved 18 April 2011. ^ "Barclays confirms £6.5bn fundraising". Banking Times. 13 October 2008. Archived from the original on 14 October 2008. ^ "Euromoney 40th anniversary special: Focus on Ipic". Euromoney. June 2009. ^ Hofman, Abigail (3 December 2009). "Abigail with attitude: Barclays' tea leaves". Euromoney. ^ a b Jeffery, Erica (12 May 2014). "Barclays' Qatari capital-raising timeline". Euromoney. ^ Thompson, Mary; Liesman, Steve (5 August 2010). "Big European Banks Benefit from AIG Bailout". CNBC. ^ Javers, Eamon (15 March 2009). "AIG ships billions in bailout abroad". Politico. ^ "US giant BlackRock buys arm of Barclays bank". The Guardian. UK. Press Association. 12 June 2009. Retrieved 21 February 2010. ^ "First Data reports Barclays contract". Finextra.com. 11 November 2009. Retrieved 18 April 2011. ^ "Barclays bank bonuses expected to reach £2bn". BBC News. 13 February 2010. Archived from the original on 20 February 2010. Retrieved 21 February 2010. ^ "Barclays to cut 3,000 jobs as profit sags". Reuters. 2 August 2011. ^ "Barclays drops the name 'Capital' from its investment bank division as the bank aligns under one name". This is Money. 20 March 2012. Retrieved 11 June 2012. ^ Bigelow, Bruce. "Barclaycard Acquires Social Couponing Startup Analog Analytics". xconomy.com. Retrieved 6 April 2015. ^ Kamanec, Kara. "Barclays Group PLC Member, Barclaycard, Purchases Analog Analytics". dailydealmedia.com. Retrieved 6 April 2015. ^ "Barclays to acquire ING Direct UK". BBC News. 9 October 2012. Retrieved 19 June 2013. ^ "Barclays welcomes customers of ING Direct UK". Barclays Direct. Retrieved 19 June 2013. ^ "Barclays to Cut 3,700 Jobs After Full-Year Loss". Bloomberg. 12 February 2013. ^ Yan, Sophia (8 May 2014). "Barclays to shed 19,000 jobs over three years". KYTV News. Archived from the original on 24 May 2014. ^ Richa Naidu (9 June 2015). "Stifel to buy former Lehman brokerage from Barclays". Reuters. Retrieved 9 June 2015. ^ Neumann, Jeannette (1 September 2014). "Caixabank to Buy Barclays Retail Banking in Spain". The Wall Street Journal. ^ "Barclays loses £500m on sale of Spanish business". Financial Times. ^ Macfarlan, Tim (30 August 2015). "Barclays set to become first UK high street bank to accept bitcoin as it starts taking charity donations in the virtual currency". Daily Mail. Retrieved 1 September 2015. ^ Wallace, Tim (1 March 2016). "Barclays to sell African bank and slash dividend as profits fall". The Daily Telegraph. Retrieved 2 March 2016. ^ Kelion, Leo. "Barclays bank joins Apple Pay in UK". BBC News. Retrieved 5 April 2016. ^ "Barclays set to sell 1.5 billion pound stake in Africa business". Reuters. 31 May 2017. Retrieved 8 September 2017. ^ "Barclays continues pullback with final exit from European retail banking". Financial Times. ^ Jolly, Jasper (7 September 2017). "Barclays and Lloyds in £10bn BoE borrowing boost". Retrieved 8 September 2017. ^ a b "Ex-Barclays boss predicts Brexit-hit London will lose out to New York". The Independent. 8 September 2017. Retrieved 8 September 2017. ^ a b c "About Barclays". Group Barclays. Retrieved 16 August 2017. ^ "Barclays slides after downgrade". BBC News. 2 February 2009. Retrieved 18 April 2011. ^ "Bank Akita News" (in Indonesian). Archived from the original on 21 July 2011. Retrieved 30 December 2009. ^ Slater, Steve (2 September 2008). "Barclays mulls Spanish insurance stake sale". Reuters. Retrieved 18 April 2011. ^ "Think Rise - Home". thinkrise.com. Retrieved 2 February 2017. ^ "Key facts about Barclays". Reuters. 16 September 2008. Retrieved 18 April 2011. ^ "Five big banks form Global ATM Alliance" Archived 7 May 2007 at the Wayback Machine, ATMmarketplace.com. 9 January 2002. Retrieved 22 June 2007. ^ "John McFarlane appointed to succeed Sir David Walker as Chairman" (PDF) (Press release). Barclays plc. 12 September 2014. Retrieved 2 May 2015. ^ Treanor, Jill (8 July 2015). "Barclays fires chief executive Antony Jenkins". The Guardian. London. Retrieved 8 July 2015. ^ "Barclays appoints James E. Staley as Group Chief Executive". Barclays. ^ "Management Structure". Barclays. Retrieved 23 March 2016. ^ "Dubai Tennis Championships". Dubai Tennis Championships. 20 February 2011. Archived from the original on 4 December 2008. Retrieved 18 April 2011. ^ McGuirk, Justin (27 July 2010). "Boris Johnson's London Cycle Hire scheme flogs our birthright to Barclays". The Guardian. Retrieved 28 April 2012. ^ "Barclays' £25m sponsorship of London cycle hire scheme". BBC News. 28 May 2010. Retrieved 28 April 2012. ^ a b "Barclays to Compensate Jews". BBC News. BBC.com. 17 December 1998. Retrieved 13 September 2013. ^ Barnett, Antony; Thompson, Christopher (28 January 2007). "Barclays' millions help to prop up Mugabe regime". The Guardian. Manchester. Retrieved 18 April 2011. ^ Macleod, Murdo (11 November 2007). "Barclays' 'helping to fund Mugabe regime'". The Scotsman. Edinburgh. Retrieved 18 April 2011. ^ Macleod, Murdo. "Barclays 'helping to fund Mugabe regime'". The Scotsman. Retrieved 18 April 2011. ^ Shankleman, Martin (11 March 2009). "Barclays 'corrupt regime' claim". BBC News. Archived from the original on 14 March 2009. Retrieved 9 March 2009. ^ "Barclays gags Guardian over tax". The Guardian. London. 17 March 2009. Retrieved 2 February 2012. ^ "Editorial: Barclays' secret documents". The Guardian. London. 24 January 2012. Retrieved 2 February 2012. ^ "Barclays Bank gags Guardian over leaked memos detailing offshore tax scam". WikiLeaks. 16 March 2009. Archived from the original on 14 April 2009. Retrieved 2 February 2012. ^ "Marie-Jose Klaver " Guardian moet documenten van site verwijderen". NRC Handelsblad. Archived from the original on 2 August 2012. Retrieved 2 February 2012. ^ Felicity Lawrence and David Leigh (19 March 2009). "New whistleblower claims over £1bn Barclays tax deals". The Guardian. London. Retrieved 2 February 2012. ^ a b "Barclays Bank told by Treasury to pay £500 million avoided tax". BBC News. 28 February 2012. Retrieved 29 February 2012. ^ "Statement of Facts" (PDF). United States Department of Justice. 26 June 2012. Retrieved 11 July 2012. ^ a b c d "Barclays fined for attempts to manipulate Libor rates". BBC News. 27 June 2012. Retrieved 27 June 2012. ^ a b "Barclays to pay largest civil fine in CFTC history". CBS News. 27 June 2012. Retrieved 27 June 2012. ^ Pollock, Ian (28 June 2012). "Libor scandal: Who might have lost?". BBC News. Retrieved 28 June 2012. ^ "Barclays to pay over 450 million dollars to settle charges regarding LIBOR". Xinhua News Agency. 27 June 2012. Retrieved 27 June 2012. ^ "Barclays chairman resigns over interest rate rigging scandal". NDTV profit. Reuters. 2 July 2012. Archived from the original on 4 July 2012. Retrieved 2 July 2012. ^ "Barclays boss Bob Diamond resigns amid Libor scandal". BBC News. 3 July 2012. Retrieved 30 July 2012. ^ "Bob Diamond quits as Barclays CEO". Philippine Daily Inquirer. Retrieved 25 April 2014. ^ "Executive Profile Antony P. Jenkins". Bloomberg Business. 23 June 2015. ^ "Three former Barclays staff charged for alleged Libor rates manipulation". London Mercury. 17 February 2014. ^ "Barclays' Qatari capital-raising timeline". Euromoney. 21 May 2013. ^ "30 Competition and regulatory matters – Annual Report 2012". Barclays.com. ^ "Barclays in Qatar loan probe". Financial Times. 31 January 2013. ^ "Revealed: The truth about Barclays and the Abu Dhabi investment". Euromoney.com. 30 April 2013. ^ "Barclays needs to come clean about its Gulf investments". Euromoney.com. 30 April 2013. ^ "Barclays charged with fraud in Qatar case". BBC News. 1 January 1970. Retrieved 20 June 2017. ^ Treanor, Jill (1 January 1970). "Senior Barclays bankers charged with fraud over credit crunch fundraising". The Guardian. Retrieved 20 June 2017. ^ "Barclays Bank charged over Qatar loans". BBC News. 12 February 2018. Retrieved 12 February 2018. ^ "FCA fines Barclays 26mn pounds over gold price manipulation". The London News.Net. Retrieved 23 May 2014. ^ "Dark pool fraud lawsuit filed against Barclays in US". New York Telegraph. 27 June 2014. Retrieved 16 August 2017. ^ "Barclays seeks dismissal of New York dark pool suit". The London News.Net. Retrieved 25 July 2014. ^ "Barclays, Credit Suisse strike record deals with SEC, NY over dark pools". Reuters. Retrieved 1 February 2015. ^ Matthews, Christopher M. (18 November 2015). "Barclays to Pay $150 Million Over 'Last Look' Trading System". The Wall Street Journal. Retrieved 19 March 2016. ^ "NYDFS Announces Barclays to Pay Additional $150 Million Penalty, Terminate Employee for Automated, Electronic Foreign Exchange Trading Misconduct" (Press release). New York Department of Financial Services. 18 November 2015. Retrieved 19 March 2016. ^ "Barclays in $13.75 mln U.S. settlement over mutual funds". Reuters. Retrieved 1 February 2015. Gamble, Audrey Nona (1924). A History of the Bevan Family. London: Headley Brothers. OCLC 18546896. "Top 1000 World Banks 2010". The Banker. Retrieved 18 April 2011. "Amer Sajed appointed Chief Executive of Barclaycard". Wikimedia Commons has media related to Barclays.